James Renwick Alliance Spring Craft Weekend Honors Therman Statom! 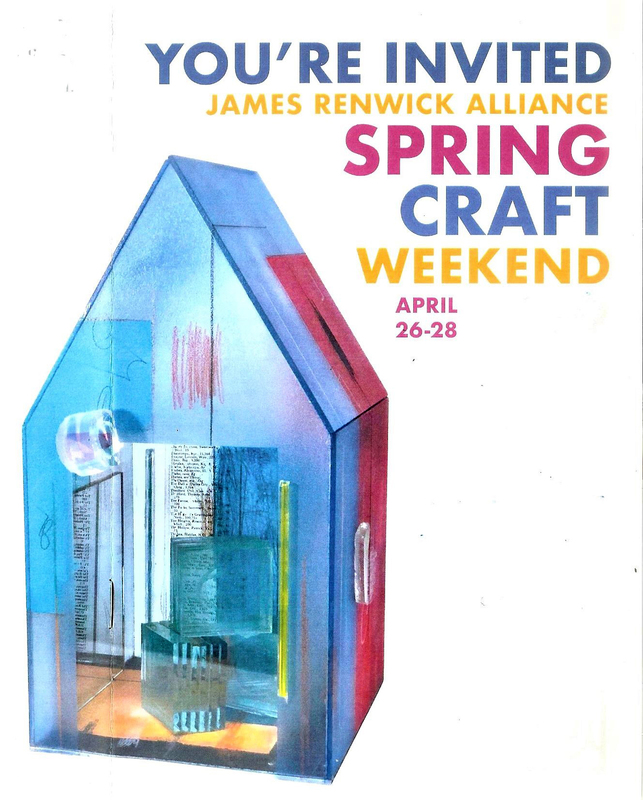 You are cordially invited to The James Renwick Alliance (JRA) Spring Craft Weekend on April 26-28, 2019 in Washington, DC. This year, the JRA honors Michael Sherrill (ceramic), Nancy Crow (fiber), Myra Mimlitsch-Gray (metal), Michael Hurwitz (wood), and Therman Statom (glass), as the 2019 Masters of the Medium @ Spring Craft Weekend. 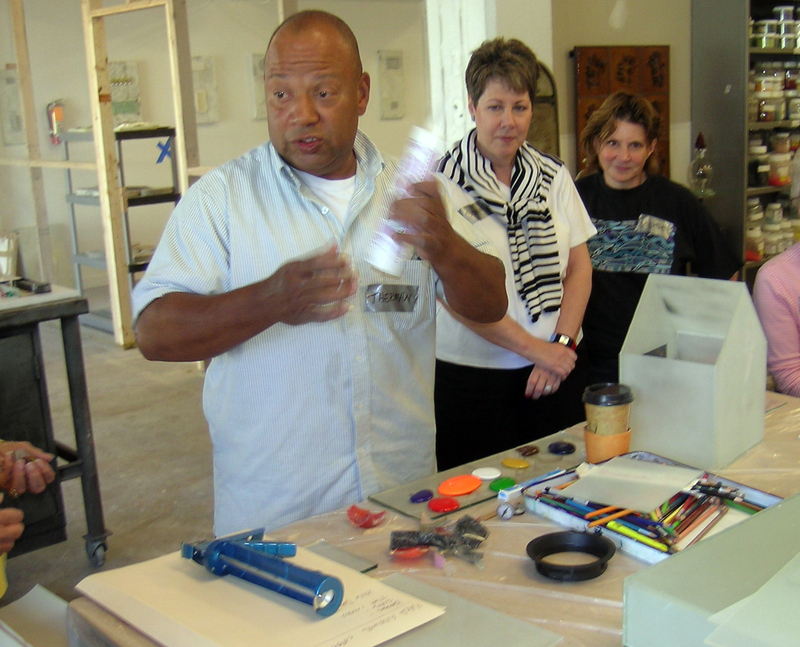 Therman Statom leading a JRA workshop at the Washington Glass School in 2006. Therman Statom is a sculptor, glass artist, and painter. Born in Florida, Thermon grew up in Washington, D.C. His interest in the arts grew from a fondness of painting and he began to investigate ceramics at RISD. However, after an experimental glass blowing session with Dale Chihuly, he was soon hooked on the spontaneity of glass and its limitless possibilities. He is most notably known as a pioneer of the contemporary glass movement for his life-size glass ladders, chairs, tables, constructed box-like paintings, and small-scale houses; all created through the technique of gluing glass plate together. 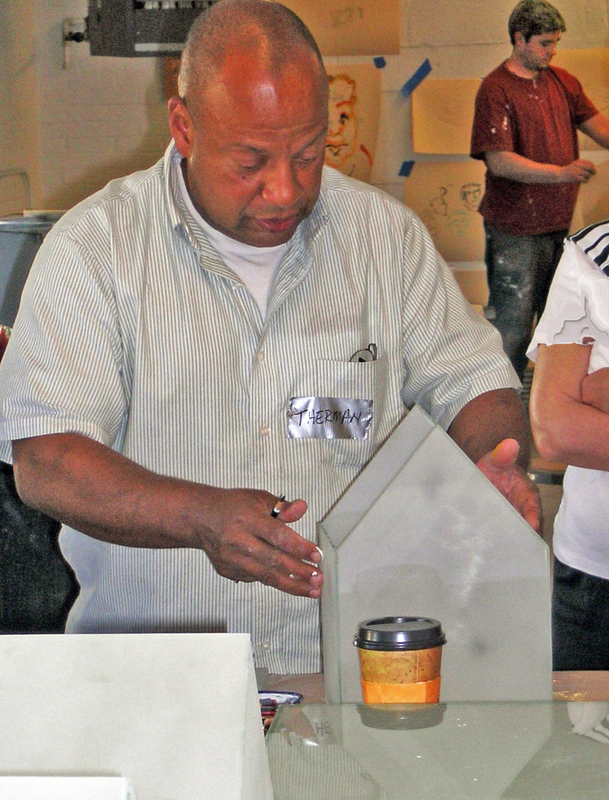 Therman Statom creates one of his signature glass houses at the Washington Glass School in 2006. Therman includes among his honors an Outstanding Achievement Award presented in 2008 by UrbanGlass, and a Distinguished Artist Award presented in 2006 by the James Renwick Alliance. Therman was awarded fellowship grants by the National Endowment for the Arts in 1988 and 1982 and he was the recipient of a Ford Foundation Artists Grant in 1997. Therman was made a Fellow of the American Craft Council in 1999. In November, 2015, he was named a United States Artists Fellow. The JRA has named Therman to be one of this year’s “Master of the Medium” and will be one of the artists honored at the Spring Craft Weekend (April 26-28, 2019) – with a weekend filled with fun and adventure! Join the Masters in the Saturday Symposium as they share illustrative images of their work and discuss their notable craft journeys that frame their careers in the field. Enjoy hors d’oeuvres and cocktails with the Masters just blocks away from the Renwick Gallery and bid on one of the ten auction items offered by the JRA at the Evening Soirée & Auction. Enjoy brunch and a celebration of American craft as the Masters of the Medium are honored at the historic and elegant Cosmos Club. Click HERE for more info on the JRA Spring Craft Weekend. The JRA is made from collectors, artists, educators, gallery and museum professionals and others who share a passion for contemporary American craft. This entry was posted in JRA, spring craft weekend, thermon statom by admin. Bookmark the permalink.